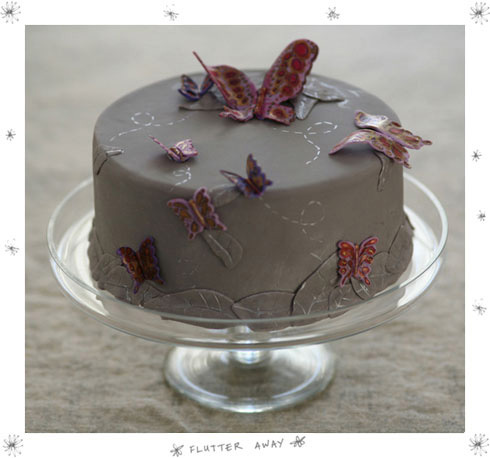 With the city once again blanketed in snow, I can so relate to the winter weary flutters that adorn Sarah Magid's inspired cake. A small business based in Brooklyn, Sarah uses organic and farm fresh ingredients for all of her baking. She loves handmaking decorations out of sugarpaste and manages to embellish while maintaining a very edible aesthetic. Extremely welcoming of custom orders, Sarah explains: "Last week I made a cake for someone who wanted a "stoner" cake, and it was organic decadent chocolate with rolled sugarpaste joints and metallic green pot leaves! That was very fun to do. And tomorrow we are making a lobster cake for an engagement party for a couple who love Main and who believe lobsters mate for life. So it will have two lobsters on top with "sand" made out of organic light brown sugar." Gotta love it. I'm a sucker for fancy schmancy cakes - I always go on wedding cake google searches...My dream is to have a 10ft high cake made by Sylvia Weinstock. what a beautiful cake. It almost seems a shame to cut it. lol. good thing she didnt make the cake with actual chronic, it would be awful publicity for such a gifted cake baker.